Includes a set of four 4″ square DURA-GRIP furniture pads. 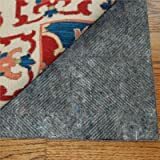 RATED #1 NON-SLIP RUG PAD: Durahold Plus is the original non slip rug pad and the best RATED for all hardwood and hard floors! MADE IN THE USA OF FELT AND 100% NATURAL RUBBER: Unlike others, Durahold is made in the USA with a U.S. patented needle-punched felt construction that prevents decomposition and shredding, minimizing mildew and odors even if damp. Thermal-set ridges on the upper surface, in an exclusive pattern of chevrons, running in multiple directions, enables the pad to grip the rug more effectively and prevents lateral motion in ANY direction. Durahold’s backing is made of superior natural rubber formulation in a new, exclusive hexagonal “tire tread” pattern, puts more real rubber in actual contact with any bare floor, no matter how slippery, and provides the highest degree of non-slip traction – PURE RUBBER, NO CHEMICALS OR ADHESIVES! 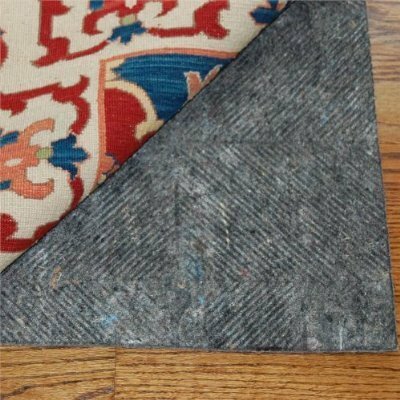 For the best in rug and floor protection, use Durahold plus rug pad. SAFE FOR ALL FLOORS: Durahold will NOT stick to or harm hardwood, wood, tile, marble, stone, vinly, linoleum, concrete or radiant heat floors. Order comes with RPFL(TM) Rug and Pad Care Guide copyright 2011.